…recently a new organisation, Theatre and Arts Reading (TAR) has been established independently of the Council with a stated ambition to provide a new theatre for Reading. TAR has been formally constituted as a Community Interest Company (CIC) and has established a strong Board. TAR has commissioned specialist consultants to assist in developing their ideas. In looking at the local market and future potential their advice has steered the group away from a small theatre towards a more commercially viable venue with 750-1,200 seats, at least two smaller rehearsal / development spaces (that could accommodate a range of complimentary functions), as well as box office and café / bar facilities. Effectively this would constitute a replacement for the Hexagon as it is extremely unlikely that the Reading could sustain two large venues. Chair of this independent ‘TAR’ organisation is Melvin Benn of Reading Festival fame. The other members are detailed on getreading’s coverage of this story. They initially set out with a brief of providing a smaller venue, circa 400 seats, to complement the Hexagon, which has long been bemoaned as too big and expensive for local arts groups. Judging by these latest developments, it would appear that aim has drifted somewhat to become simply ‘build a theatre’. Now TAR proposes a larger venue, based on advice, and the council responds with a view that such a new venue should replace the Hexagon. In my view, replacing the Hexagon with a venue around five sixths of the size (I make that a Pentagon for the record) does not represent a sufficiently ambitious goal for live entertainment in Reading, or Reading’s place in the region. We should at least have an Octagon, if not a Do-decagon, and if we need a triangle or a square then let’s have one of those in addition – not instead. After last week’s proposals for an ice rink worse than Bracknell’s, now we have the plan for a theatre worse than Basingstoke’s. Evidently, the council is relatively pessimistic about funding prospects, and about the demand for Theatre. Many large towns, or medium-sized cities comparable to Reading do manage to sustain multiple larger venues. But arguably I draw my comparisons unfairly. And here comes the first headache. We know that one of Reading’s greatest assets is its access to central London. However, with the West End comfortably within striking distance for an evening out, demand on local venues inevitably must be impacted. On funding, the last time the prospect of replacing the Hexagon came up in 2006, the council was sadly unsuccessful in a lottery bid. Now the proposal is to seek a private organisation with whom to form a joint venture to meet the estimated costs of at least £25m. It’s clear that what is really needed is for a wealthy local individual to come forward and offer the money, purely in the name of philanthropy – and to have his or her name on the building. I know some people are critical, but the Madejski model is a throwback to, in my view, a very natural way of funding institutions and public buildings. I, and I think most local people, are grateful for what Sir John has done for the town. Wouldn’t it be great if someone else stepped forward this time? The final headache is location. With the council committing that the new venue will be open before the Hexagon could be demolished, there must clearly be a new site, with current council ownership likely to be a pre-requisite. The 2006 lottery bid earmarked Hills Meadow car park. I’m keen that this inspired choice remains top of list this time around. The history of Hills Meadow surprisingly evades the attentions of the internet. We can presume it didn’t exist until the construction of Reading Bridge in 1923 saw George Street extended from the current laundry site to effectively chop Christchurch Meadows in half. The image below was recently posted on the Old Reading Facebook group. 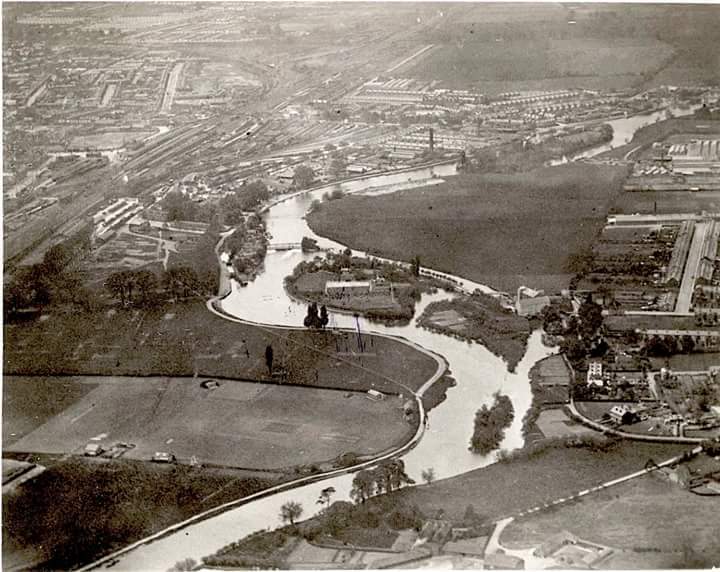 The photo looks towards the West showing the meadows in the centre shortly before the appearance of Reading Bridge. Quite why it’s called Hills Meadow is also uncertain. It’s likely to be named after the former Victorian Mayor of Reading Arthur Hill. He was a coal dealer who presumably made enough money to fund the free concerts he put on during his time as mayor. The swimming pool that bears his name was built on land donated by his family after his death. This does indeed sound like the sort of person we could do with to help with the current headaches. But why do I think this is such a good location? As I’ve said before on this blog, Reading’s riverside is a trump card that’s been unplayed for too long. Having grown up around the Kennet, Reading has apologetically tip-toed up to the Thames. I think it’s time to make more of a statement with our stretch of the world-famous river. A striking waterside theatre with bars overlooking the river would be fabulous asset to the town. The pragmatists might argue that the location, whilst attractive, might not be the most convenient for access. I would counter that you’re just five minutes’ walk from the station. Not only that, but thinking ahead, there are plans to run a dedicated bus lane, and potentially later a tram, along Napier Road, over Kennetmouth to Thames Valley Park, where a park and ride is also planned. 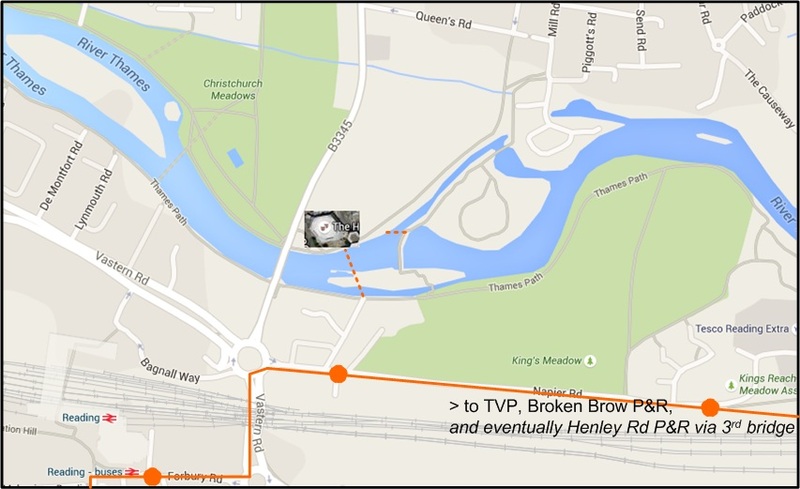 A stop near Reading Bridge would provide very convenient access. That access could be improved further with a redevelopment of Caversham Lock Island from a grotty cluster of maintenance buildings to leisure use, with footbridge access to Hills Meadow. Such a plan has been tabled before and could come forward again. See indicative map below. On the question of space, I’ve copied the overhead view of the Hexagon and placed it onto Hills Meadow, to show that plenty of space would remain for parking. A two-level multi-storey could be built within the site without being too intrusive. I think it’s time to be ambitious. A remarkable building, in a beautiful location could command the reputation and prestige to support a venue of a slightly bolder scale than is currently being mooted. With the ever-improving range of destinations and frequency of train services running through Reading station, Hills Meadow can bring in the numbers from nearby towns in a way you’d expect from a regional capital, and get them home again after a great night at the theatre. And most importantly, it would be a fantastic facility for the people of Reading. What a dreadful idea- more incursions of concrete onto Readings limited green spaces. Keep the theatre in the centre of town- existing transport l;inks, bars restaurants and shopping to make a day of it. Thanks for your view Andrew. There’s a strong argument in favour of the current location too. But with the station becoming ever more the ‘centre’, Hills Meadow is fairly close by. Also, I would characterise Hills Meadow car park as grey rather than green. Plus, locating the theatre there would draw more people over the bridges to enjoy Reading’s Thamesside parks.